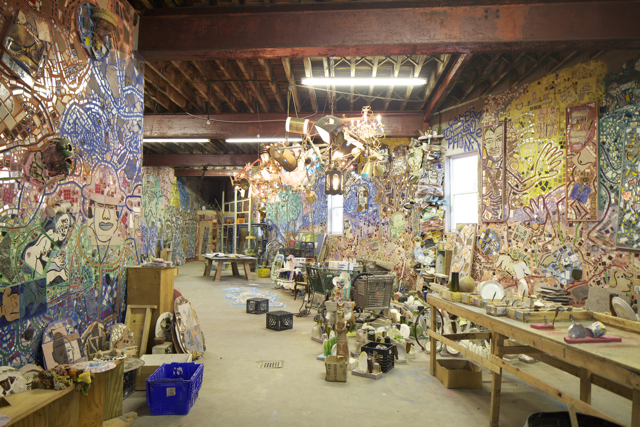 The Watkins Street Warehouse is the latest project by Philadelphia artist Isaiah Zagar. He is in the process of covering virtually every interior surface–walls, ceilings, and eventually floors as well–with his mosaics, while also using the space as his studio for other work. 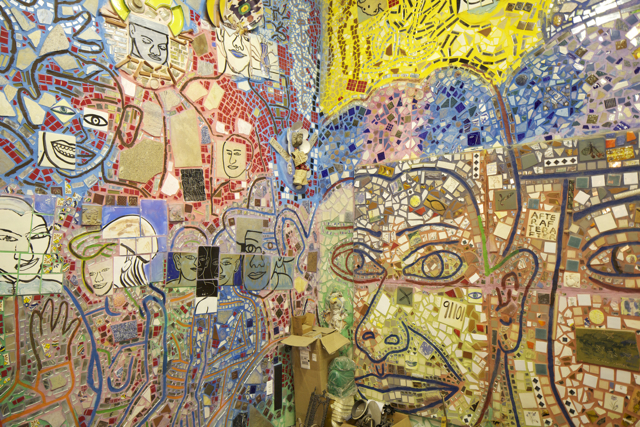 Zagar has been creating colorful mosaics on private and public walls in the area around South Street since 1968 when he moved to the neighborhood with his wife Julia. His first project was Julia’s still-thriving folk art store, the Eyes Gallery, at 402 South Street. Zagar has been prolific, completing more than 130 murals in Philadelphia and throughout the country. 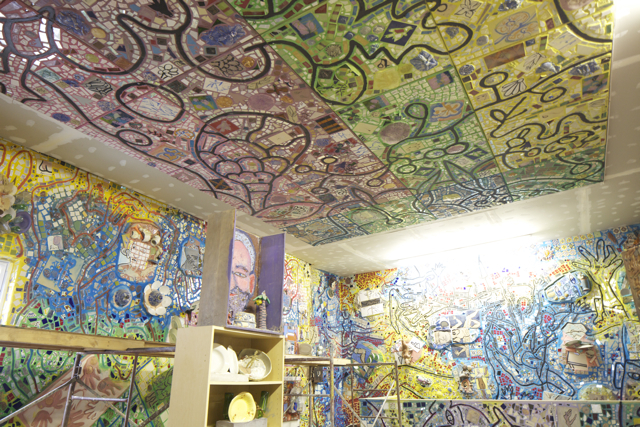 Zagar’s best known work is Philadelphia’s Magic Gardens, an installation on 10th and South that took 14 years to create. He excavated tunnels and grottos, sculpted multi-layered walls, and tiled the 3,000 square foot space. The mosaics incorporate visual anecdotes that reference his wife Julia and sons Ezekiel and Jeremiah through playful images and words, but also integrate elements of the wider world: Latin American artworks, the local dance community, and artistic influences such as Pablo Picasso, Ferdinand Cheval, and Marcel Duchamp. In a Dream, the award-winning documentary created by son Jeremiah Zagar, offered audiences the first glimpse of the Watkins Street Warehouse, which has not yet been opened to the public. 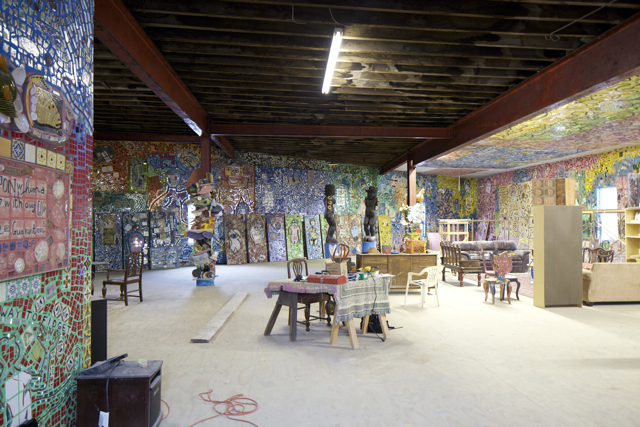 The closing scene depicts the 10,000 square foot South Philadelphia space that Zagar purchased in 2006. The façade and much of the interior are already coated with glimmering tile and glass. When complete, the fully-embellished property will feature light installations from Zagar’s renowned friend Warren Muller, an exhibition gallery for visual art, and a multi-level performing arts space. This former auto mechanic warehouse will allow Zagar and Philadelphia’s Magic Gardens to expand their mission of community outreach and artistic collaboration. 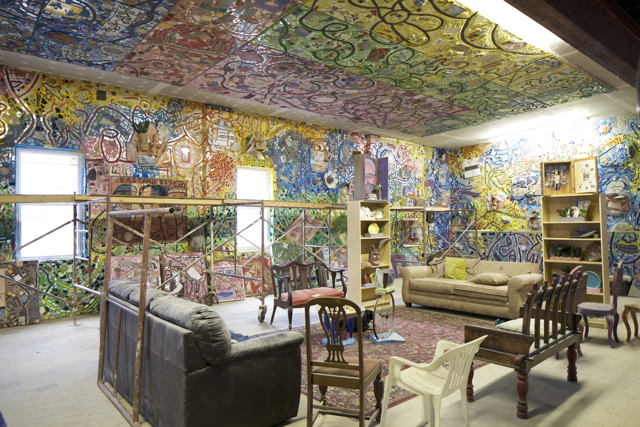 The warehouse is covered in Zagar’s mosaics which would visually compete with visual art installations. The mosaics contain both visual and textual narrative that could work as a source for theatrical dance, spoken word performances and other specific kinds of interventions. Nine sites, nine art projects, nine ways to see the city anew. Join us May 23-June 30 for our second Festival--everything you love about Hidden City's programs and journalism wrapped into six weeks of fun and exploration.